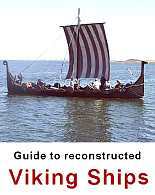 Historians may debate whether or not the Imme Struer is actually a Viking ship at all, as it is a replica of the Ellingaa ship of Northern Jutland, which was strictly speaking built in the Middle Ages. 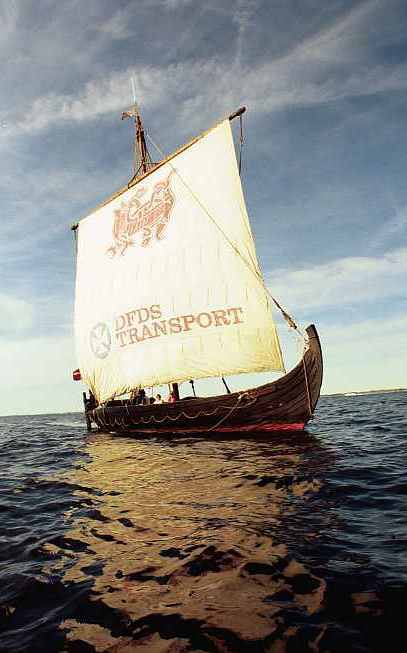 But the shipbuilders probably did not waste much thought on this when they built the original in AD 1163, and indeed the ship has preserved so many characteristics traits of the Viking ship that it can be termed a Viking ship. Like so many other replicas, it was built by scouts. On the eve of the huge scout-gathering at New Haithabu in 1969, scouts from Aarhus built the ship from freshly cut oak timber. The 9,5 meters long keel, weighing 1,6 tons, was cut from one single trunk. Ribs and knees are cut from naturally curved timber, and the ship in general has a highly convincing appearance. It is a heavy ship, and the oars are primarily intended for manoeuvring in harbours, but in good wind conditions it can sail at a high speed, also while beating up against the wind. In spite of its many qualities and sturdy construction, the ship has led a difficult life. The day before launching, it was hit by lightning that split the stem, and it has several times since then been wrecked when thrown against the coasts of Eastern Jutland. The scouts who built it eventually developed other interests, and at one point it was handed over to a group that founded the ship’s guild of Imme Aros. The guild gradually shrunk to a group so small that getting people to maintain and sail the ship got difficult, and in the spring of 2003, the ship was bought at the price of 1,- Dkr by the Struer Museum, renaming it Imme Struer. During this summer, it will be thoroughly renovated on the harbour in Struer, and a boat guild is being established to maintain it. Terms of hiring: Will be determined, once the ship has been renovated and relaunched.